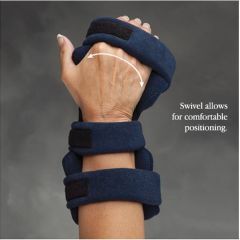 Comfy™ Deviation Hand Orthosis Unique swivel joint below the wrist allows lateral and medial positioning for gradual decrease of ulnar or radial deviation. Easy to adjust. Malleable form allows gradual extension of fingers and wrist. One size fits left or right.